Whispers in the Loggia: Five Years Since Lampedusa, "Today's Pharisees Build Walls"
Five Years Since Lampedusa, "Today's Pharisees Build Walls"
It might be apocryphal, but a story from the first weeks of the rule of Francis nonetheless resonates five years after the fact. 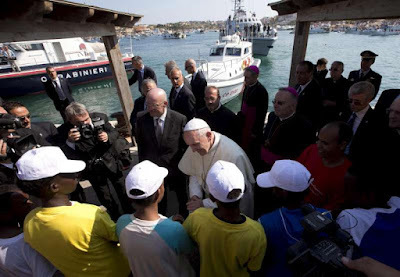 In sum, after Papa Bergoglio read in the papers about the near-daily shipwrecks of migrants crossing the Mediterranean, hundreds drowning by the month, out of nowhere the Curia was said to have been alerted by Alitalia that someone claiming to be the new Pope was trying to book seats on the morning flight to the boats' landing spot at Lampedusa. To be sure, every new pontificate is a matter of adjustment as it wends through its initial paces. But that tale highlighted the degree to which this one would be more than most – if anything, five years on, in many quarters the acclimation to the "new normal" remains an ongoing process. As the world marked the fifth anniversary of Francis' election in March, a single word on the milestone from the Pope himself was conspicuous by its absence. 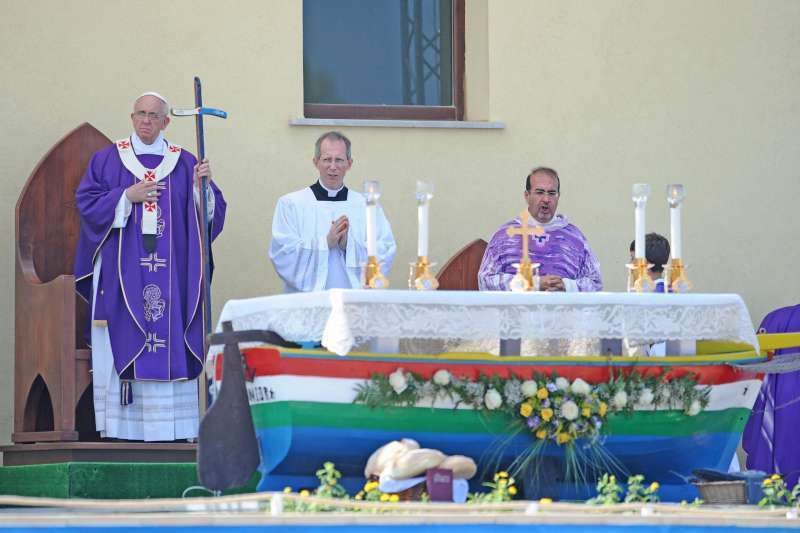 Four months later, however, he chose instead to commemorate five years since his first trek outside Rome – his penitential pilgrimage to Europe's "Island of Tears" at Italy's (and the continent's) southern tip, whose bishop he would subsequently make a cardinal as a sign of his enduring closeness and solidarity. 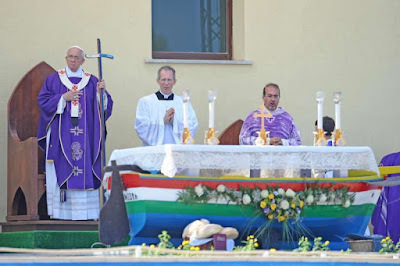 Announced only on Wednesday, at mid-morning today the pontiff led a rare papal Mass at the Altar of the Chair at the back of St Peter's – arranged with the explicit purpose of being a liturgy for migrants, the congregation was comprised of some 200 invited refugees.